Chess is a struggle! In this video, twice US Chess Champion GM Patrick Wolff (1992 & 1995) teaches the defensive techniques that have been developed by grandmasters. 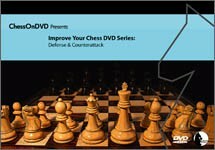 The author shows you how to: Defend and protect the weaknesses in your position and how to protect your king; Strengthen your position; Defend difficult and inferior positions: Beat off attacks, and assume the initiative; Develop counterplay using tactical and strategical methods, and much more.